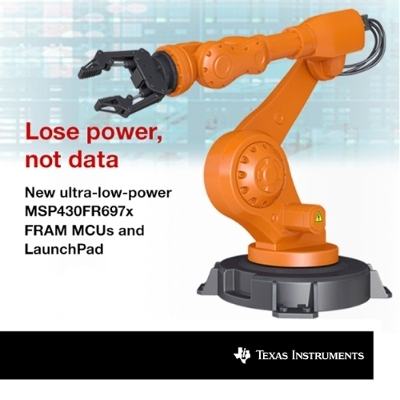 Overcoming a design hurdle that has burdened engineers for decades, Texas Instruments (TI) (NASDAQ: TXN) today announced a revolutionary Compute Through Power Loss (CTPL) technology to enable context save and restore across its MSP430™ FRAM microcontroller (MCU) family, including the new MSP430FR6972 MCU. This patent-pending technology enables instantaneous wakeup with intelligent system-state restoration after an application unexpectedly loses power. In addition, the new MSP430FR6972 MCU with TI’s CTPL technology includes integrated smart analog and digital peripherals to reduce system cost, power and size. These features include a low-power segment LCD controller, a 12-bit differential analog-to-digital converter (ADC) with internal window comparator, and a 256-bit AES accelerator. The ultra-low-power MSP430FR6972 MCU with 64 KB of non-volatile FRAM highlight TI’s leading ULPBench scores for 16-bit MCUs and can be used for data logging to enable applications such as a wireless motor condition monitor. This system was developed as a TI Design in Kilby Labs, TI’s center for innovation research, and is paired with TI’s bq25570 energy harvesting IC and SimpleLink™ multi-standard CC2650 wireless MCU to operate from a coin cell battery for decades. This system monitors and analyzes motor vibration frequencies and allows operators to accurately predict and schedule maintenance, reducing potential for machine failures. Reduces manufacturing costs by decreasing programming times on an assembly line. Unified FRAM allows flexible memory use across data and application code – a very flexible solution for updates in the field. Unbeatable write speeds, combined with 10 billion times more write-cycle endurance compared to traditional non-volatile memory solution – excellent for data-logging applications. Further simplifies code development because it does not require pre-erasure of segments and can be accessed at the bit-level, enabling constant on-the-fly data logging with zero extra power. Integrated 116-segment LCD driver includes software-configurable LCD pins that enable quick and easy hardware layout; an integrated charge pump allows the LCD contrast level to be maintained even when the MCU is in low-power modes. Additional integration includes 52 capacitive-touch-enabled GPIO, five timers, comparator, real-time clock (RTC) counter and SPI, UART and I2C communications to reduce system cost and product size. Inherent benefits of non-volatile FRAM, LCD controller and built-in security features make MSP430FR6972 MCUs ideal for smart flow and electricity metrology co-processing, building and factory automation and blood glucose meter applications. RTC standby current consumption of 700nA and ULPBench score of 117.5 showcase MSP430FR6972 MCUs as the industry’s lowest-power 16-bit MCU with LCD. TI’sEnergyTrace++ technology enables developers to analyze power consumption in real-time and includes the unique ability to provide both system and peripheral state information. This allows engineers to take control of their power budget and optimize software to create the lowest energy applications possible. Detailed migration guidesand application notes ease migration from existing flash MCUs to MSP430 FRAM MCUs and portability within the code-compatible MSP430 FRAM family. MSP430FR6972 MCUs and variants are available in production quantities starting at USD $2.15 in 1ku. The MSP-EXP430FR6989 LaunchPad allows developers to start evaluating with a full-feature board for only USD $17.99. The MSP-TS430PM64F target socket development board and MSP-FET programmer/debugger are available for full development at USD $175. Discover the benefits of TI’s MSP430 FRAM MCUs. Learn about theultra-low power MSP MCU platform. Read theMSP430 Blog on TI E2E. Ask questions and help solve problems in theMSP forum on the TI E2E™ Community.